While America’s liberal establishment continues to rage at Trump, Europe allies, under the influence of Washington, maintain their aggressive stance towards Russia following the catastrophic US meddling in Ukraine in 2014 and the subsequent reunification of Crimea with Russia. The question is how can the narrative of ‘malign Russian influence’ be kept going? Mainstream media will continue its role in this, but Western governments are also pouring resources into promulgating certain narratives while containing others. 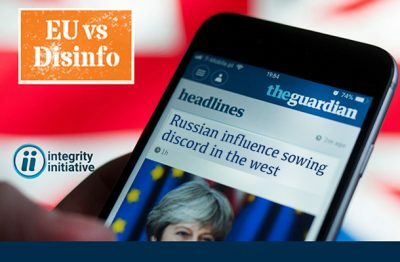 This week, hackers released more documents from the UK government-funded project known as the Integrity Initiative, revealing British government plans to build an umbrella network of organisations across Europe to counter ‘Russian disinformation’. The following is a look at one of the EU projects already operating to ensure European populations do not stray from this constructed narrative that at times crosses over into real xenophobic racism, or Russophobia. While researching this phenomenon, it was impossible not to find some of the EU’s counter-propaganda material quite funny. see hostile states publicly ‘called out’ for their egregious behaviour – with coordinated international attribution of cyber and other attacks. To protect its version of history the EU has created mechanisms to fight off alternative realities, narratives, or truths – which ever word fits – claiming any fact or opinion contrary to those of the stated EU decree must be condemned as pro-Kremlin, pro-Russian, or ‘Putinist’, a derogatory depiction presently supported by the corporate media. The EU claims these ‘alternative narratives’ are the product of a Russian disinformation campaign and has developed resources to ‘disprove’ that disinformation. These are the EU vanguards of truth set up and funded by the European Council in 2015: the European External Action Service East Stratcom Task Force or unaffectionately known here as Team East Stratcom. A brief study of their work only leads to further concerns about who is manufacturing history, but also to the likely conclusion that Team East Stratcom is made up of media studies students who drink beer and watch RT all day. Narratives and sources. Does this mean that any narrative which matches a Russian one is then classed as Russian in origin? If a Western alternative media outlet publishes a narrative which happens to match that of a Russian media outlet, does this then mean that the said alternative media outlet is ‘under Russian influence’, or ‘in league with the Kremlin’? Could such a politicized method of labelling lead to potential McCarthyite targeting of independent journalists? Disinformation Example 3: Russia is depicted as a ‘defender’ and a ‘peacekeeper’ and the West – as the villain. Nina Cross is an independent writer and researcher, and contributor to 21WIRE. To see more of her work, visit her Nina’s archive.